Discovering Laos: Things to Do in Luang Prabang — 2checkingout | travel and adventure | Inspiring. Capturing. Experiencing. 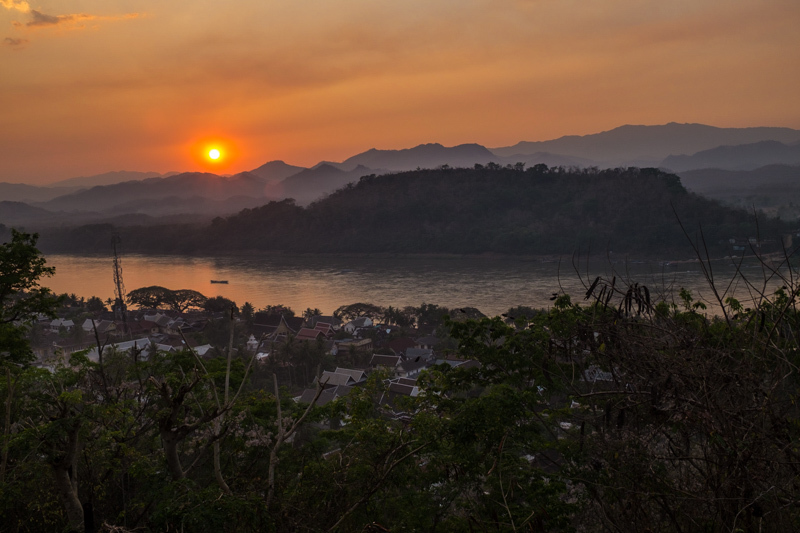 Luang Prabang hugs the bank of the Mekong River and is a UNESCO World Heritage Site. The French colonial influence evident in the buildings as you wander the main streets. 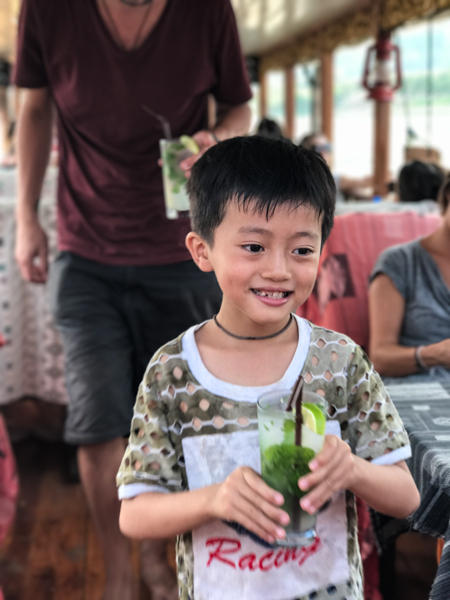 We chose to spend our first week in a brand new country for us soaking up Laos culture in this quiet laid-back former capital. Our journey from the airport was in a shared open taxi, the driver magically remembering where each of us needed to be dropped off. Our guest house, Souk Lan Xang, a traditional wooden house built in 1955. Spacious with all the mod cons, including on our first night, a raucous party next door. Our host, assuring us that this was a one-off, and it was. The main road is crammed full of cafes, bars, and restaurants. Perfect for watching the world drift passed. With the French connection, there are lots of pastries in the cafes to tempt the sweet tooth. Breakfast most days was in one of the cafes overlooking the Mekong. One of our favourite meals was at Joy’s. Here we tried the traditional Laos dish Laab, albeit a vegetarian version, incredibly tasty. We also had a chance to chat with owner Joy about life in Luang Prabang. Each night there is a market aimed mostly at tourists that stretched for a couple of a hundred metres. Here you can buy your ‘Same Same, But Different' T-shirts, along with bamboo speakers for your phone and bottles of rice whisky, complete with scorpions for additional flavour. At the far end of the market is a narrow alleyway jam-packed with food stalls. Grab a bowl and fill it with a variety of local cuisines including barbecued Mekong River fish. Without the fish, it is just NZ$2 (US$1.50/£1.10) a bowl. The fish costs between NZ$3 - NZ$10 (US$2-US$7/£1.70-£5.70) depending on size, a bargain and very tasty. Early morning a local food market runs downs the side of the Royal Palace. Certainly worth a visit to soak up the dizzying array of smells and colours. Be warned though some stalls are not for the faint-hearted. One evening we jumped on one of the many long river boats that ply their trade on the Mekong for a sunset cruise, this one run by Sa Sa. It came complete with complimentary mojitos served by a cheeky young chappy. The haze provided an effective sunblock but ruined any chance of getting that killer photo. Another vantage point to watch the sun go down is at the top of Mount Phou Si. You have to be at the top early to grab a good spot as most of the tourists in town seemed to venture up each night. But don't let that dampen the shimmering golden vista that is on offer most nights. One of the draw cards for many visitors is the alms giving ceremony. The ceremony takes place each morning at sunrise. In days gone by Buddhist monks in their bright orange robes would file through the streets receiving a gift of sticky rice from the local women. 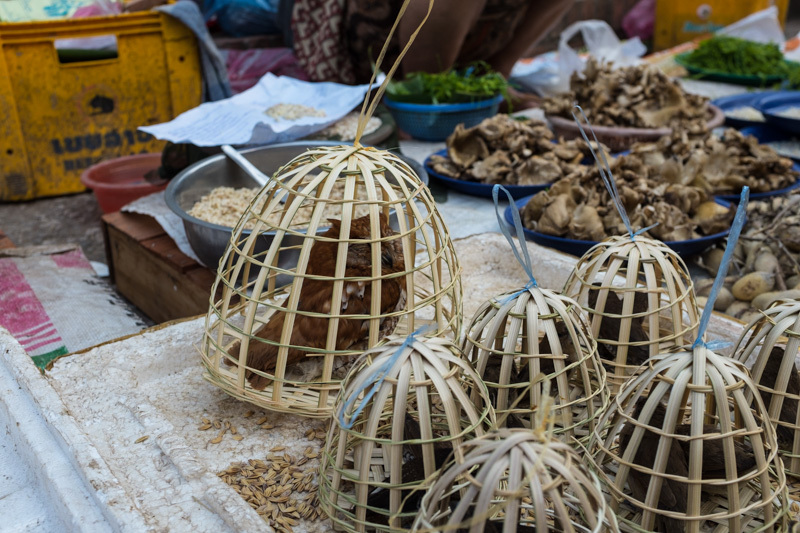 The offering is said to build a connection between the humans (locals) and the spiritual (monks/nuns) and is not, as often perceived by westerners, a form of charity. Today the ceremony in Luang Prabang, for the most part, is a total sham. Some locals sell dodgy stale rice to the tourists, who then line the pavement on coloured plastic stools (too posh to squat on the floor). There are tour groups of people complete with their Laos-style sash that hand out bags of crackers, biscuits and other sugar-filled crap that the monks discard in the nearest bin as soon as they can. Then to top if off, you have tourists who think it’s their God-given right to shove their camera into the faces of the monks as they walk by. We had a good idea of what the ceremony had turned into but we wanted to see it with our own eyes. Even still we were shocked and outraged at the behaviour of our fellow travellers. Keeping our distance, we saw one local man intervene on several occasions as camera-wielding tourists blocked the path of the monks. Local rumour has it that the monks wanted to stop the sham of a ceremony, but the Laos Government has insisted it continue in case it hurts tourism. Away from the main street, one or two locals do still find space to honour this long-standing tradition, away from the hoards of self-indulgent, self-centered tourists. The best way to witness this tradition, be it in Luang Prabang or elsewhere is by keeping a respectable distance. Your photos come a distant second to the needs of those taking part in this tradition. On a more positive note, Big Brother Mouse is a local charity where tourists can make a real difference. Just off the main road is a buzzy office where young locals gather twice a day to practice their English. Tourists are invited to sit down and chat with the mostly young guys who have a barrage of questions relating to learning English. A couple of hours here zooms past, as you help the community enrich their education. We talked about New Zealand, the All Blacks, and the Haka, the countries we had visited and our adventures in general. Those attending soaking up knowledge like eager sponges. 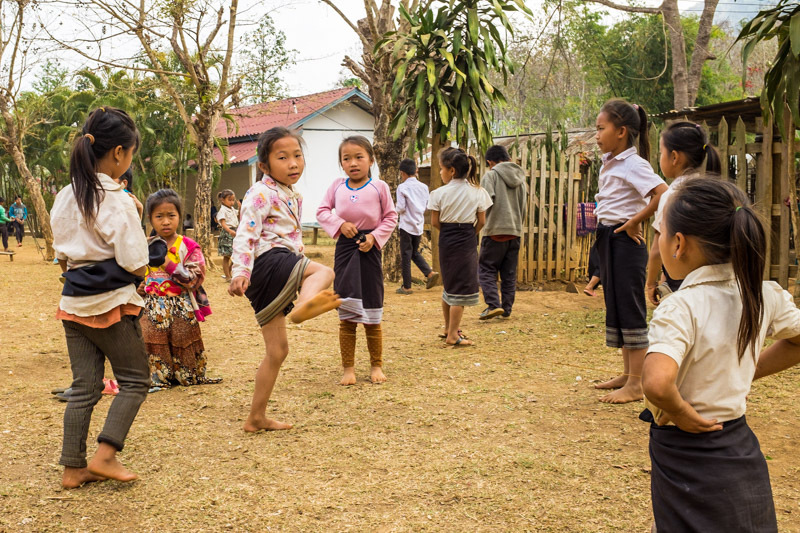 And in return, we got to learn more about local customs and the Laos way of life. If you are visiting Luang Prabang, please pay a visit to this worthwhile charity. Our only excursion outside of town was to the popular Kuang Si Waterfalls. We booked a day trip through White Elephant Adventures. We had high expectations as the price was almost double the cost of other trips to the waterfalls, but this one did include a hike, lunch and a visit to the local hill tribes. Our guide Yue was very enthusiastic and relatively new to the job, just two weeks in. Along with two French girls, we jumped into the back of an open-sided truck. An hour later we arrived at the first hill tribe village very dusty and bruised from bouncing along the dirt track roads. The hill tribes in this area are the Hmong and Khanu. Visiting villages is not quite our thing. It always feels like you are imposing on the local life. 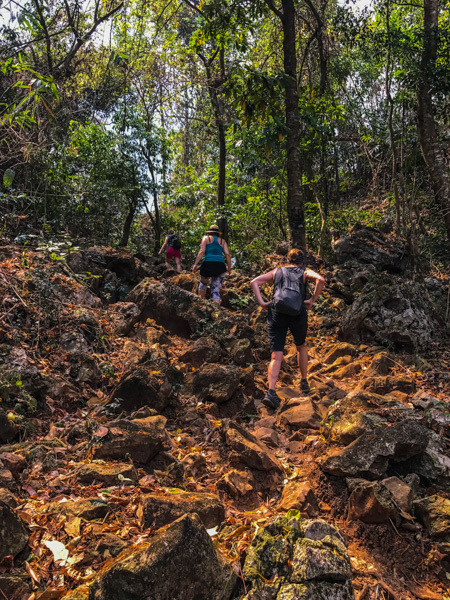 This was a little different as the hike started at the village and wound its way through the several kilometres of countryside, passing rubber plantations on the way to the waterfalls. In the first village, we picked up a local guide, all of 13 years of age. I was also charmed out of NZ$1 by two giggly young girls who were selling bracelets. We stopped for a lunch of veggies and rice at the source of the river that feeds the waterfalls. The last part of the walk was all downhill and pretty tricky given that there had been quite a bit of rain in recent days. At the top of the falls, some wooden platforms provide a stunning view of the surrounding countryside. There are also natural pools for swimming and chilling out. The crowds increased dramatically at the bottom of the multi-tiered falls. But with a little patience, we managed to get a couple of photos without people. I do love a good waterfall. I had a quick dip in one of the pools good for swimming, the water cool but sparkling. Julie stood guard over our belongings. On the way out of the park, there is the Free the Bears, Sun Bear Rescue Centre. Donations fund the centre and the bears have either come from captivity or have been found abandoned in the wild. The enclosures look a little tired, but the bears themselves looked in excellent condition and appeared to be happy in their surroundings. We were surprised that they don't charge a small admission fee. We did buy a T-shirt to help support this worthy cause. Value for money for the day, hmmm borderline? We did make one or two suggestions to the owner who seemed to take our thoughts on board. On our return to Luang Prabang, we had bottle or two of the national export, BeerLao at Utopia, a cafe-come-bar overlooking the Nam Khan River. Plenty of chill out space for the young and not-so-young. Luang Prabang is a busy wee town, but it didn't feel overwhelming. Despite the many visitors the town has managed to retain a gentle pace of life. During the day most visitors are out of town exploring the surrounding countryside. In the evenings there is enough choice of restaurants and bars that it sometimes feels almost empty. The busy season is January and February when the weather is a little cooler. For us, it was time to head south and to experience a first for both of us. Our next stop was the small town of Kasi, to try our hand at riding a motorbike. Transport South was in the form of an air-conditioned minibus which was full to bursting. Thankfully we were one of the first to be collected, so we had the pick of the seats. However, the last pick up saw a French guy completely lose his cool. He was not happy that either he or his girlfriend would have to sit in the jump seat next to the driver. She hid with embarrassment around the side of the van as he unloaded on the driver. A young Canadian guy stepped forward and offered to swap places, not even a hint of a thank you from Monsieur Angry. 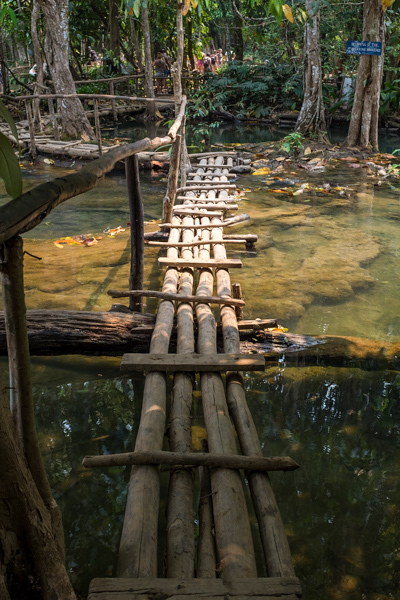 Onto to Kasi, read more in Adrenaline Overload: My First Motorcycle Adventure, Laos Style. We ate at Joy’s Restaurant, Delilah's, and Amigos, all great value for money and really good food. We visited Kuang Si Waterfalls with White Elephant Adventures NZ$70 (US$51/£40) included transport, guide, village fee, waterfall park fee and lunch. Plus a 10% off voucher for food at Utopia.